At AJ Tensile we take the quality of our work very seriously, and that includes diligently testing the products we manufacture. 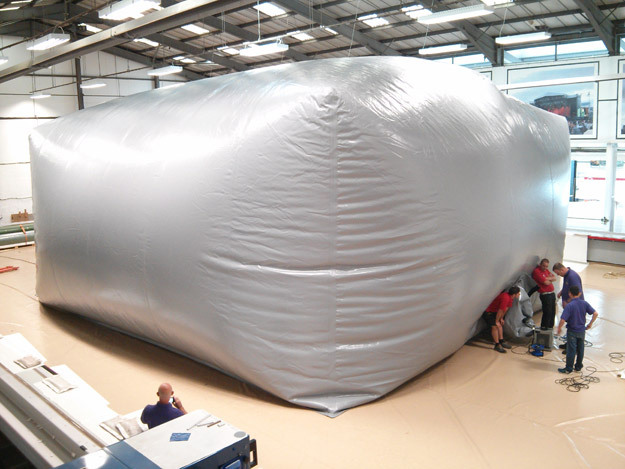 This little 750 cubic metre single-skin PVC biogas bag, shaped to fit within an existing building in Lancaster, was carefully inflated to its working pressure over a period of several hours and tested to ensure it remained airtight. Inspectors then climbed inside through our unique design of ‘elephant trunk’ access hatch before being sealed inside, where any pinpricks of light shining into the blackout conditions would highlight faults in the fabric or in the 300-odd metres of welding. As expected, the whole gas bag passed first time with zero errors. If you’ve ever tried deflating a lilo then you know how difficult it can be to get all of the air out. Now imagine that problem multiplied by a factor of a few thousand and it’ll give you an idea of the challenge faced by our team when the testing was complete and time came to pack up the gas bag ready for shipping. Amazingly, the whole 700kg bag eventually compressed down to a bundle of about three cubic metres for easy transportation to site.